Good morning! Well, the weekend is almost here. Do you have plans for something fabulous? Nothing too special as far as plans go here. 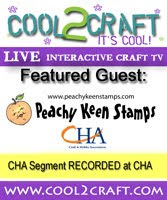 I've been busy this week in the craft room coloring away on images for the next Peachy Keen Stamps release, now it's on to card stock and paper, and in only a few more days, the sneak peeks will begin! I think you're really gonna like this new release! Fun, fun, F.U.N.!!! Since I can't share what I've been working on with you just yet, I thought I'd share some pictures I took a couple of weeks ago. It's calving time here on the farm, and 3-5 trips to the pasture every day to check on the girls is a necessity. I love to ride along, and those times when I can snap a few pictures to share are the best! I hope you enjoy them!! Rolling hills. LOTS of rolling hills. Curious about what we're doing. #14. We helped this one into the world the night before this picture was taken. The setting sun... cow silhouettes. Thanks for dropping by today! It's gonna be a rainy day here, but that sounds like good crafting weather to me! Have a glorious day and happy stamping!! Wow, what amazing pictures!! Love the sillouette and sunset ones. Being from Los Angeles, I always wondered what it would be like to live on a farm!! TFS!! Hi. I drop by your blog every now and again to see what you've been making with your Cottage Cutz. I like your style :). Love this blog post. I live out in the country in Australia amoungst the cattle and produce farms. I liked the photos of your farm, especially your cattle dog. We've got two out on the farm, on red anad one blue. Great dogs!